In 1984 I pulled the above specimen from a muddy ditch during a pouring rain near the confluence of Gunpowder Creek and the Ohio River in Boone County, northern Kentucky. It changed my life. 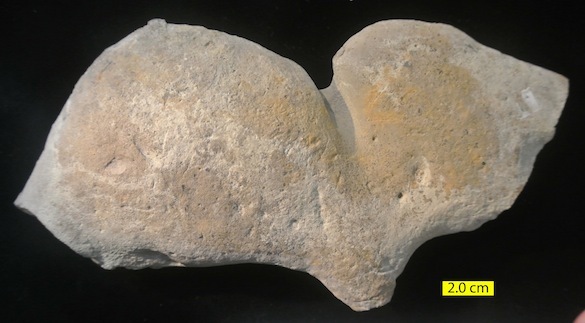 This limestone cobble eroded out of the Kope Formation, a shale-rich Upper Ordovician unit widely exposed in the tri-state area of Kentucky, Indiana and Ohio. It probably is a burrow-filling, given its somewhat sinuous shape. 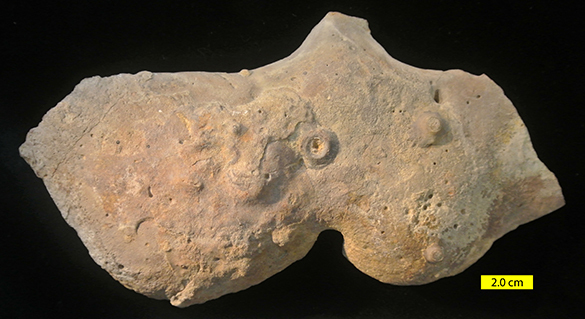 As you can see in the closer view above, it is encrusted with crinoids (the circular holdfasts) and bryozoans of several types, including the sheet-like form in the upper left and the mass of little calcareous chains spread across the center of the view. There are also simple cylindrical borings called Trypanites scattered about. There were other cobbles at this site as well, including the one imaged above. 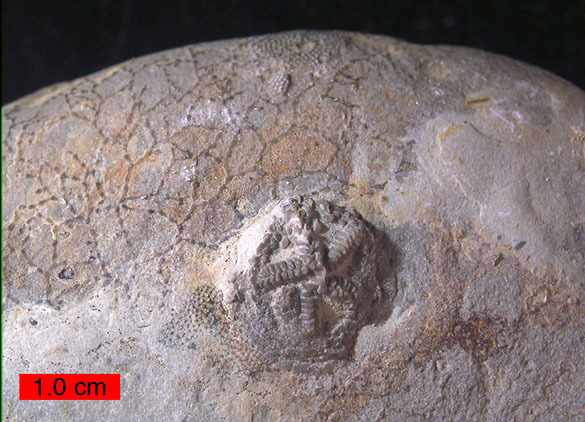 It shows an encrusting edrioasteroid (Cystaster stellatus, the disk with the star shape in the middle) and a closer view of those chain-like bryozoans (known as Corynotrypa). Significantly, the underside of the cobble pictured at the top of the page is smooth and mostly unencrusted, showing just a few of the Trypanites borings. 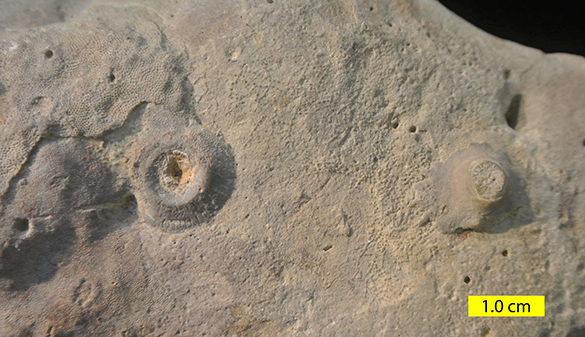 A closer look, though, would reveal highly-eroded remnants of bryozoans. This means that the cobble sat on the seafloor with its upper surface exposed long enough to collect mature encrusters and borers. It appears, though, that the cobbles were occasionally flipped over, killing the specimens now on the underside and exposing fresh substrate for new encrusters. How did this cobble change my life? My wife Gloria and I were scouting field trip sites for my Invertebrate Paleontology course. I was a very new professor and needed localities for our upcoming travels. I thought I had seen enough during that wet and chilly day, but Gloria wanted to explore one more outcrop. Fine, I thought, we’ll stop here at this muddy ditch and she’ll be quickly convinced it was time to quit. As I stepped out of the car I saw this cobble immediately. Then we both saw that the ditch was full of them. They showed spectacular encrusting and boring fossils with exquisite preservation, but more importantly they demonstrated a process of ecological succession rarely if ever seen in the paleontological record. It led to two papers the following year that came out just before my first research leave in England. There my new interests in hard substrate organisms led me to my life-long friends and colleagues Paul Taylor and Tim Palmer. Since then we’ve published together dozens of papers on encrusters and borers, now known as sclerobionts, and used them to explore many questions of paleoecology and evolution. Thank you, Gloria, for one more outcrop! Wilson, M.A. 1985a. Disturbance and ecologic succession in an Upper Ordovician cobble-dwelling hardground fauna. Science 228: 575-577. Wilson, M.A. 1985b. A taxonomic diversity measure for encrusting organisms. Lethaia 18: 166. Wilson, M.A. and Palmer, T.J. 1992. Hardgrounds and Hardground Faunas. University of Wales, Aberystwyth, Institute of Earth Studies Publications 9: 1-131.